WHY GO: The view. The food. The youthful, collaborative, entrepreneurial energy. And it’s all just one subway stop from downtown Manhattan. I cannot emphasize the vitality of this Hudson River city enough. Home to Liberty State Park (and you thought the Statue of Liberty was closest to New York), the iconic Colgate Clock, and some of the most anticipated art and culinary projects in the Tri-State area, today’s Jersey City has shed its industrial identity and celebrates a shared industriousness. 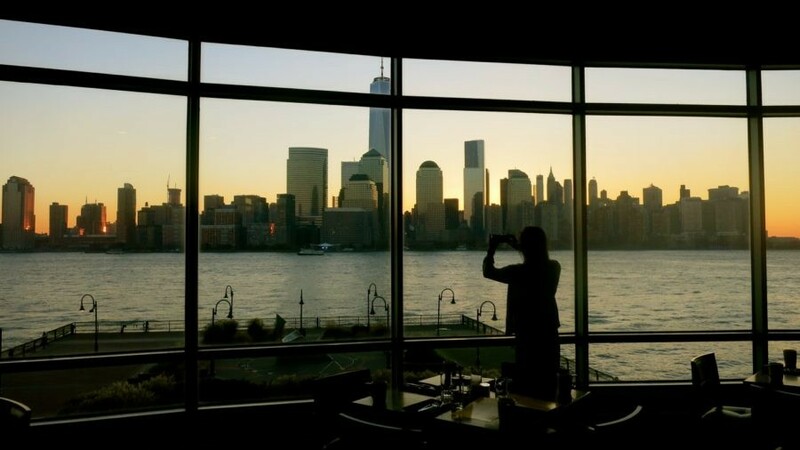 At night, stay in a waterfront hotel with a singular exquisite panorama of Manhattan, just a few hundred yards across the River, for a completely unique close-by getaway. 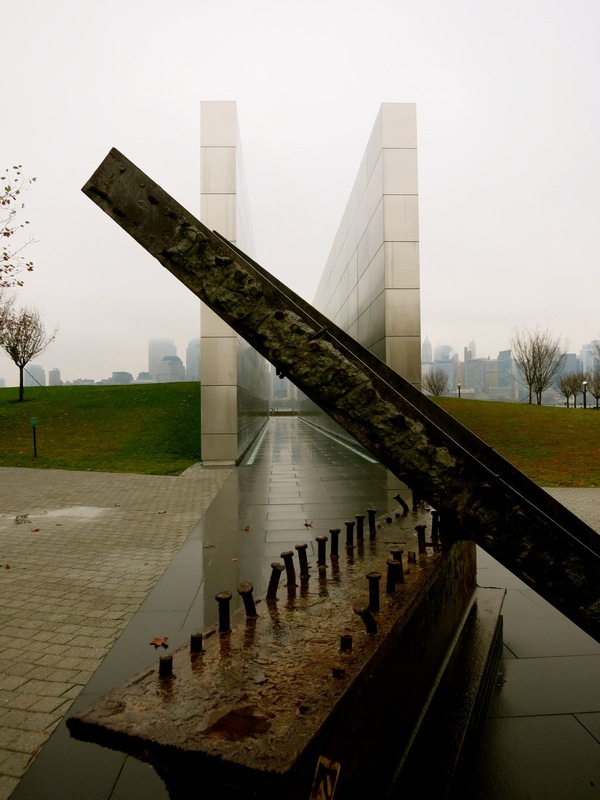 VISIT: Empty Sky Memorial at Liberty State Park. Two 210-foot long brushed steel rectangular slabs, lying on their sides and inscribed with the names of 749 victims of 9-11 from NJ, represent the fallen World Trade Towers. What heightens the experience is that, peering through them towards downtown NYC, they reintroduce the towers back into the skyline. It’s a poignant optical illusion, plunging you back to that horrific day. In the park, you can also visit the interactive Liberty Science Center, or take a quick ferry to the Statue of Liberty. Be aware that there are no signs to the Memorial, but Liberty Park Visitor’s Center staff will provide you with a map to get you there. Park opened daily 6am-10pm. PHOTO OP: Colgate Clock. Formerly sitting atop the demolished Colgate-Palmolive building, this 50 ft wide clock has been a Jersey City icon since 1924. The factory building may be gone, but the octagonal clock remains, and has become a JC attraction in and of itself, right on the riverfront. TOUR: Mana Contemporary. This is the most pristine, museum-like, collaborative, mixed use storage facility of its kind. Anywhere in the world. A brand new concept, championed by two Israeli guys, Moishe Mana and Eugene Lamey, who brought Moishe’s Moving to New York, the million square-foot Mana Contemporary (soon to be doubling in space) has coalesced into a self-contained networking community for the performing and fine arts: Basically, a terrarium for artists and those who work with them. What began as a storage and shipping center has fast become a magnet for artists and art collectors – and now the public as well. 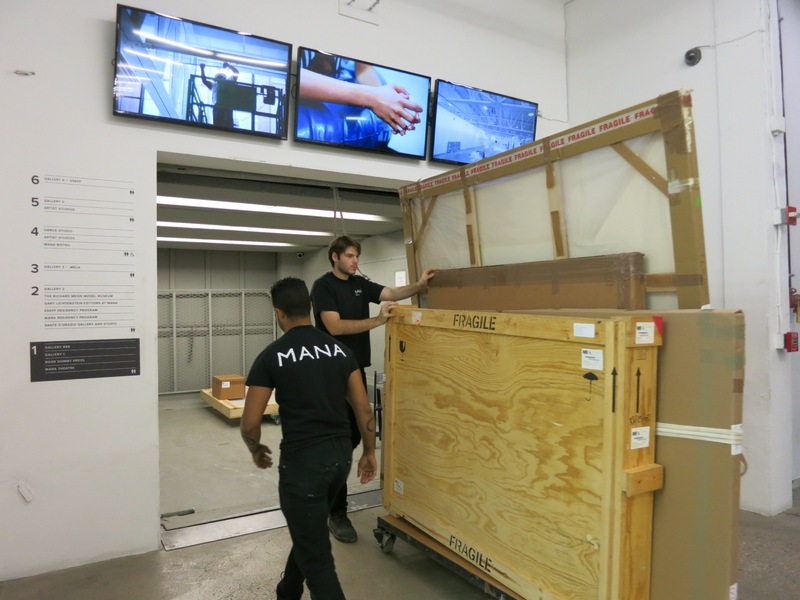 Mana and Lamey asked high profile collectors, “why keep your artwork packed in crates when you can exhibit your collections for all to see? They’re here, anyway.” So the partners built big, bright, gleaming galleries to showcase contemporary art to greatest effect. Then, Mana and Lamey enticed established and emerging artists to this repurposed tobacco factory, opening 100 individual studios that provide both solitude and “lets-get-a-cuppa-coffee” community. (When an artist’s studio door is open, it’s an invitation to come in and talk). The six massive floors of Mana Contemporary are filling up by the month – with a whole gallery devoted to four hundred Richard Meier architectural models, photography studios, book publishers, a silk-screening workshop, a crating shop, a frame-maker, a bistro, and even the studio and Production office of the Armitage Gone! Dance company. Coming up – more performance spaces, more galleries with a focus on international art, more restaurants, two hundred more artist studios, living quarters (lofts), International Center for Photography (ICP) Collections and Media Lab (coming May ‘15), and a hotel for far flung collectors. Lemay insists that this facility is “not a museum. 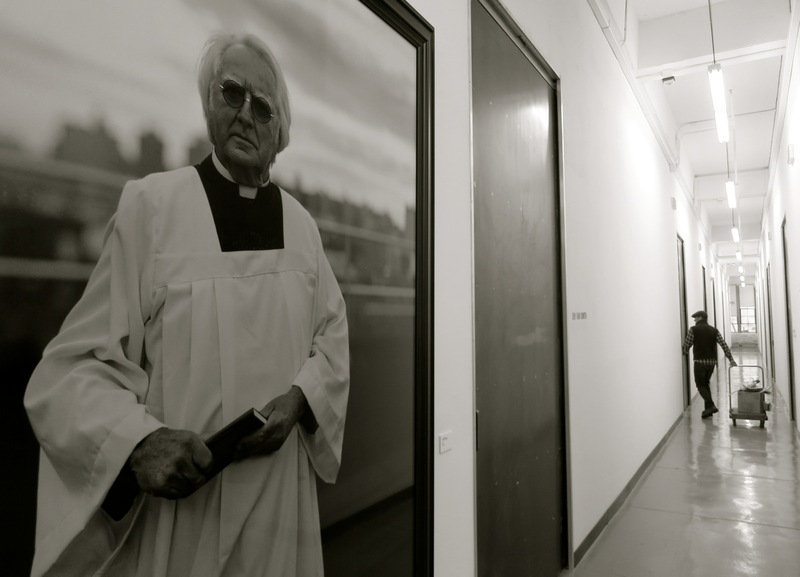 There’s no place like this in the world.” Collectors can come and visit their once-hidden-away, now exhibited art, and then head into the warren of artist studios to see what tickles their fancy next. Collectors-in-the-making find a fertile field here. Artist need not leave the grounds (or the building) in order to frame, crate, and ship their pieces around the world. And a growing number of art-lovers are learning about this Jersey City sensation, and come for an hour-long tour (Monday – Friday) or quarterly Sunday Open Studio Tours. For now, there are shuttle buses from Milk Studio in Chelsea NYC, or you can just stroll in. But you cannot roam around the place – only artists are allowed to do that. The rest of us must take a guided tour. Mon-Fri 10-5, tours at 11, 2, 4 daily, free. TOUR: Landmark Lowes Jersey Theater. Called “The most lavish Temple of Entertainment in New Jersey” when it opened in 1929, The Lowes hosted all the preeminent stars of the day. Burns and Allen, Bob Hope, Judy Garland, Cab Calloway, Jean Harlow and more graced its boards before the Landmark Lowes fell on hard times and descended into rats nest shambles. In the 1980’s The Friend of Lowes, recognizing the theater for the astounding palace it is, saved it from the wrecking ball. The city took it over in the 1990’s, turned into a multiplex cinema, and then closed it down, leaving this Landmark an attraction in process. Walk into the lobby, and its opulent beauty will stun you. The theater still houses its original light board and an intricate organ, identical to the one that played during silent films in the ‘30’s. This one came “in pieces” from an old movie theater in California. “It took eleven years to put together – like a jigsaw puzzle,” said one docent. Tours can be arranged through the office for now. This area of Jersey was built on the stuff – Maxwell House was the largest employer in Hoboken, NJ in the mid 20th century (before closing altogether in 1992). 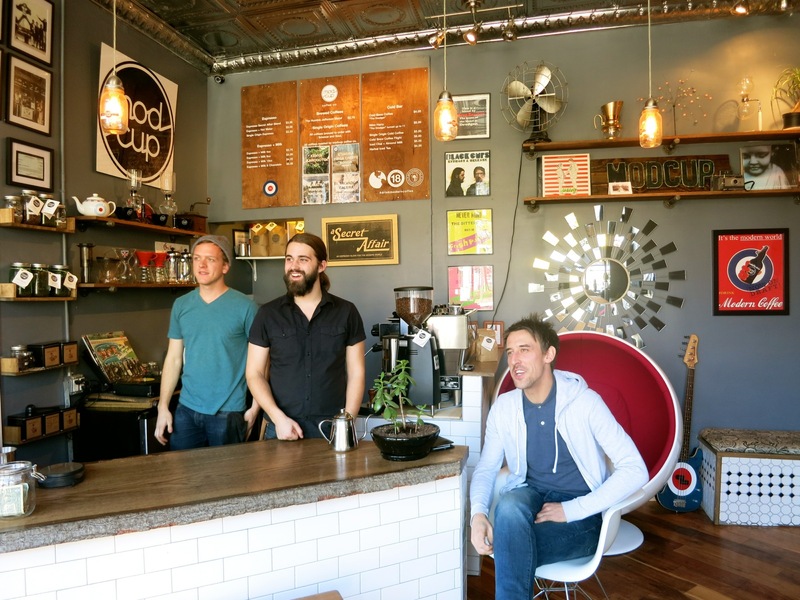 “We’re reawakening the coffee culture here,” says Clifton. ModCup opened a laid-back shop on busy Palisade Avenue (across from a park that overlooks the Hudson River and NYC), and sells its own blends, roasted just down the street, to area restaurants. It also has the country’s “only mobile coffee roaster” – a reconditioned 1969 bread truck from Normandy France – that shows up at PGA events, local festivals and private soirées. Come here for a revelatory cup and you might be a convert, too. EAT: Razza Pizza Artigianale. I’ve never met a man so euphoric, so PhD scholarly, about yeast and bread as Dan Richer, owner of the Jersey City pizza joint, Razza. He has a habit of carrying around a tub of warm, frothy dough to showcase his proprietary yeast blend, revealing his passionate obsession with all things naturally leavened. Passion, of course, doesn’t always translate into excellence. But in this case it does. Distressed plaster walls, wooden church pew booths, stacked cordwood reception desk – Razza is woodshed chic. But what drives the nightly crowd isn’t the surroundings – it’s what emerges from the wood-fire oven. I cannot even begin to describe the incredible mouth-feel of Dan’s beloved bread. All I can say is that it is worth the $4 per portion cost (comes with “handmade cultured butter from grass-fed Lancaster PA cows”) and then some. One bite of the crust that crumbles without the need to gnaw, and the warm, chewy, yeasty center and I was hooked – hooked enough to rethink my order of pizza and request another few slices of bread. But the pizza, and the mountain of “Kale Caesar” salad that accompanied mine, was just as toothsome as the loaves of rustic wheat and rye that Dan bakes daily (only 18 loaves a day for now), and rivals the world-renowned pies charred in my home state of Connecticut. No wonder New Yorkers are now swarming here. EAT/SNACK: Koro Koro. Carrie Grosso and Vincenzo Bove have perfected the art of the sticky rice ball. 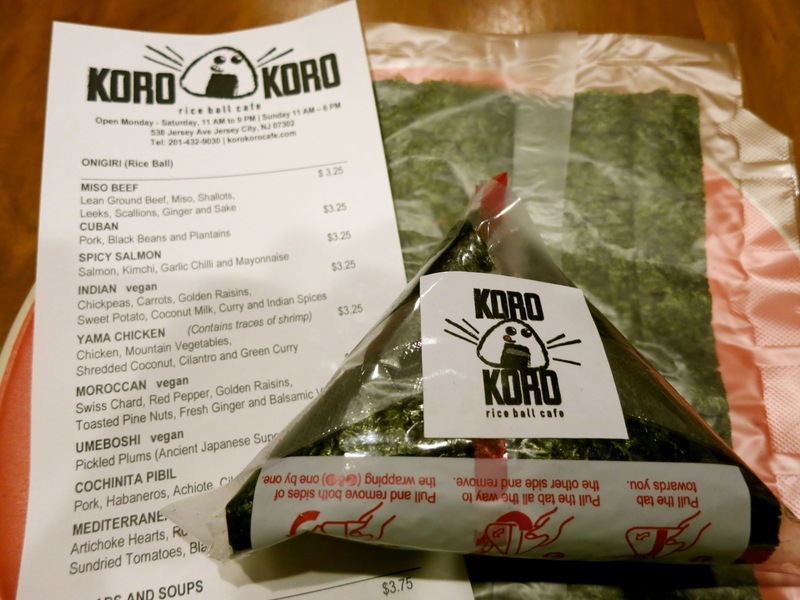 Selling onigiri – Japanese comfort food – from a tiny storefront, these sweet triangles of deliciousness, wrapped in seaweed, can be made a bunch of ways: Spicy Salmon with Kimchee and Cuban Pork with Black Beans the most requested. Just $3.25 a pop, two will more than fill you up, and are healthy, gluten free and awesome. EAT/DESSERT: Choc-O-Pain. Next door to Koro Koro, satisfy your cocoa cravings at this real deal bakery. Half of the pastries feature chocolate, including the “fly out the door” Kouign (pronounced “Queen”) – caramelized min-croissants with chocolate chips. Uh oh, cholesterol be damned. 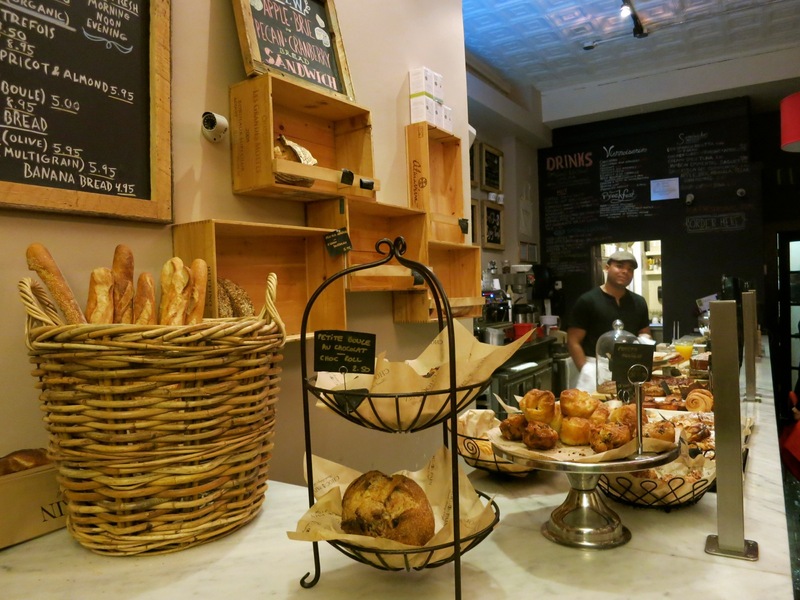 EAT/PROVISION: Talde And Carrino Provisions. 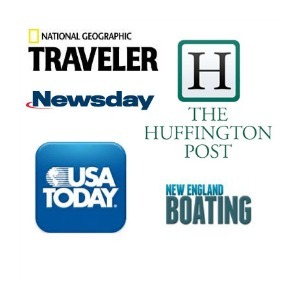 Here’s another collaboration for the Age of Reality TV. Dale Talde, darling, but never the winner, of Top Chef, and Anthony Carrino, star of HGTV’s “Kitchen Cousins,” have bro’d up to open a unique Italian Provision Shop/Asian American Restaurant in a repurposed NJ-NJ Bell switching station turned Jersey City Police Headquarters. Talde, who runs a Brooklyn restaurant of the same name, interprets World food through a pop-American lens. The result? “New Culture.” Hence, “Lobster Tonka,” a version of the Italian Lobster Roll with Fra Diablo sauce, and other “fun, tasty food” in a funky 168-seat restaurant. As you can imagine, with kitchen designer Carrino as partner, the space is eclectic as all get out: Old School Italian Market meets Night at the Kasbah exotic. Jersey City drawing Celebrity Chefs? Who’d a thunk it. EAT: Locals like The Oak on Pine, Cellar 335, Just BeClaws, and a growing roster of eateries. Culinary-wise, JC is a happening place. STAY: Hyatt Regency Jersey City. 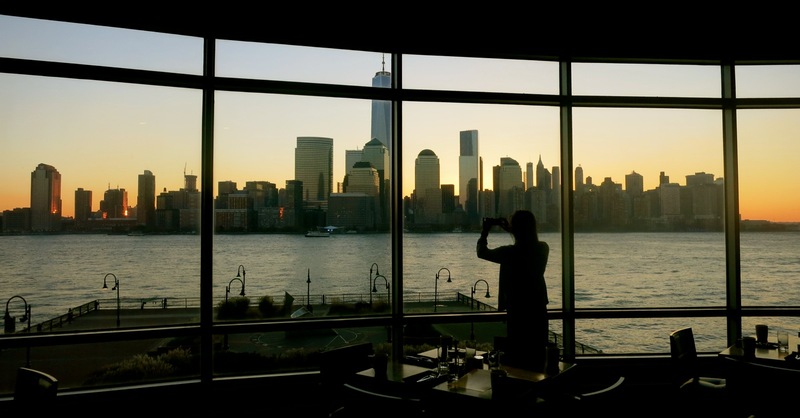 Stay right on the pier with unparalleled views of lower Manhattan, especially from the chic restaurant/lounge, Vue. Rooms are Hyatt fine, with updated cloudlike bedding and granite counter bathrooms. Rates start at $230 per night. Nice job ladies on covering my home city!